It's back to the attic today for another family photo. 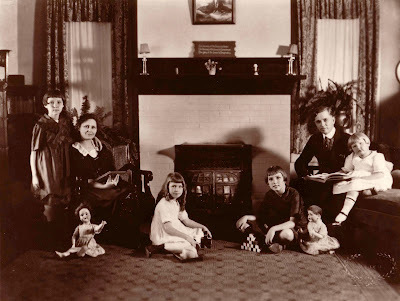 Today I'm featuring a photo of my great-grandparents' family at home. I believe this photo may have been taken at their home at 301 East Scott Street in Gainesville, Texas. My grandmother, Marymac, is on the far left with her arm around her mother's shoulder. I'm a few days behind....just read the triathlon post. WOW! Our son does those down in TX & his weakness is the swimming. He has also done 'Mud Challenges' & the pictures he sent are pretty messy. Great photo. Four girls! I have a son and a daughter. I love them both, but I cannot imagine four girls in the house! Your great grandmother must have had tremendous patience. Only one of the girls would not comply with the hairstyle? Great picture, love the 20s/30s hairstyles of the girls, and the fact that the dolls are also part of the family. I tried to match this picture with the other ones using the 'Old Family Photos' tag; it's becoming quite an interesting collection! I always wonder about these photos. the quality of composition, lighting etc suggests a professional photographer, but do you think he would have visited the home? Judi, my wife did a mud run once - fun but messy. Mary, from everything I heard, this home was filled with a lot of love and laughter, but four girls is a lot to handle even in the best of conditions. Virgil, I don't know what the motto is supposed to be. I wish I did. Rob, you're right, I've almost got a collection going now. Just to keep you up to speed, from left to right, is Marymac, Mary, Dorothy, Marguerite, E. S., and Jane. Three of the four girls became missionaries. Marguerite went to China, Dorothy to Lebanon, and Jane to Mexico. Brett, this photo has always been interesting to me. The family appears too dressed up and stiff for it to be an amateur photographer. I think it must have been a professional who came to the house. From experience, I agree that four girls is something of a handful. With two demanding dolls as well, oh dear. My wife, part of whose family is from Lebanon, had a great aunt who was a nun near Beirut somewhere. The original format of the photograph may have clues as to whether it was a professional photographer.